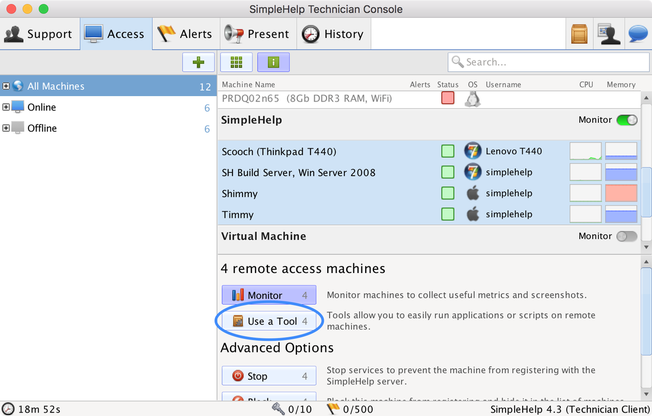 Remote Management features are built into SimpleHelp, and allow you to manage and support large sets of remote machines without needing to connect to them. Get alerted about changes on the remote machines and easily run tools across multiple machines concurrently. NOTE: Remote Management features require the SimpleHelp server to have a Management license. You can upgrade your standard SimpleHelp license to allow these features here. Receive alerts about your remote machines. Automatically take action when there is a problem. Run toolbox items across multiple remote access machines concurrently. If the available disk space on my server drops below 10% then send me an email. Reset - the metrics have changed and are not beyond the reset threshold. ​In the example above, the monitored metric is Available Disk Space and the alert is monitoring my server. If the free disk space drops below 10% then the alert will enter a Triggered state, and if it increases above 10% the alert will move into a Reset state. The 10% here is the threshold that the metric must pass for the alert to switch state. Alerts can be configured to take actions when the state switches to triggered or reset. In the above example the alert will email me when the alert triggers. 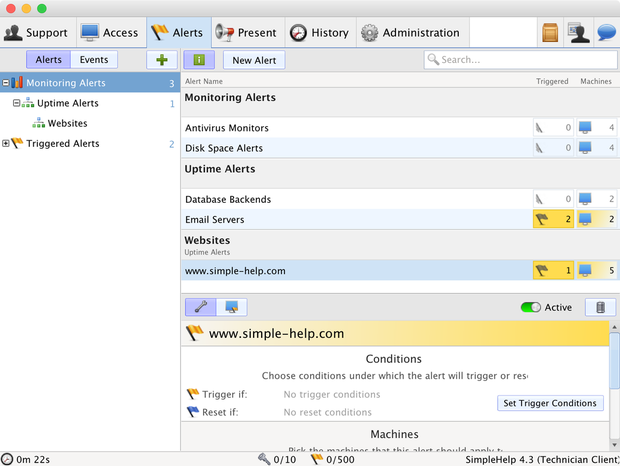 SimpleHelp supports a variety of alert types. Alert types are chosen when the alert trigger or reset conditions are set, and are grouped together by category. 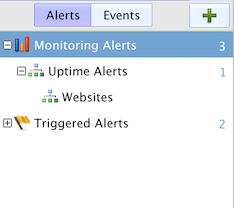 Received alerts to do with resources on a remote machine, like CPU, memory or disk usage. Monitor the CPU usage on the remote machine. Receive alerts if it is consistently high. Receive alerts if the remote machine is running low on memory. Receive alerts if the available disk space on the remote machine is running low. Receive alerts if one of the drives on the remote machine is about to fail. Receive alerts specific to applications running on the remote machine. Check that the AntiVirus software is running and up to date. Receive alerts if the firewall on the remote machine is not running. Get alerted if a process is using the CPU excessively. Get alerted if a process is using too much memory. Check that a specific application is running on the remote machine. Received alerts to do with file size, access and modification time. Check if a file exists, can be written to and opened. Receive an alert if a size of a specific file exceeds your limit. Receive an alert when a file is modified, or if it has not been modified for a long time. Get alerted about network or server issues. 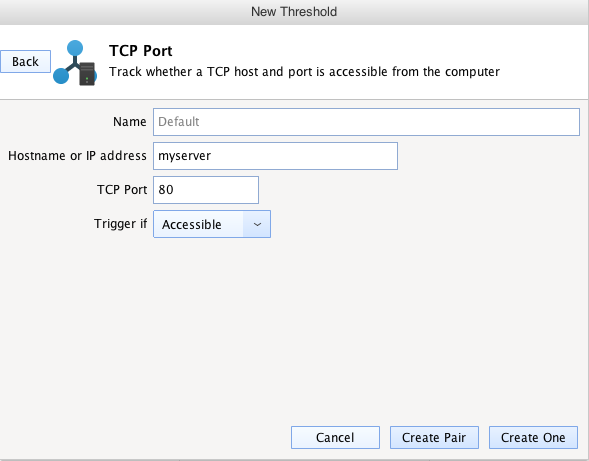 Check whether a TCP port on the remote machine is open. ​Check that a specific website is available from the remote machine. ​Monitor the response time from a website and get alerts if it is high. Custom Alerts allow you to run any of the Tools from your Toolbox on a schedule on the remote machine. As they are run the return code of the tool run will be checked against whatever you specify to determine if the alert should be triggered or not. You can create a new group by pressing the green + button. Created alerts can then be dragged from one group to another. All created alerts are listed under the Monitoring Alerts main group. If an alert is in a triggered state it is also included in the Triggered Alerts group. If you wish to easily see which alerts are currently triggered you can do so by selecting this main group. Alerts are listed in a table structure in the Alerts tab. Alerts in the same alert group are listed together. Each alert is contained on a single line, with additional information about the alert listed to the right. The alerts table conveys a range of information about a particular alert. Active / Inactive: an active alert is one that is currently monitoring services. An inactive alert is dormant. The alerts table shows inactive alerts, like New Alert above, as greyed out. Triggered Machine Count: the Triggered column contains a count of the number of machines that are currently causing this alert to trigger. If this is not zero, the column is shaded yellow to indicate that the alert has triggered. Machines Count: the count of the number of remote access services that this alert is monitoring. Your new alert will automatically be created and placed in the currently selected group. The alert will also be selected and the alert details panel below will list an overview of the alert's current configuration. If the details panel is not visible make sure that the "I" button to the left of the New Alert button is toggled on. 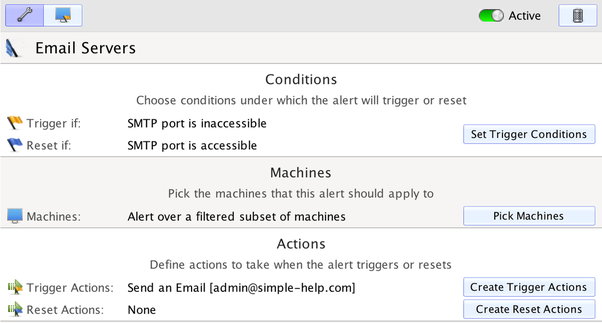 Alert Configuration: the details of how the alert is configured are presented. Triggered Machines: list the machines that are currently causing this alert to trigger. An alert can be made active or inactive by toggling the switch to the right of the button bar. If you wish to delete an alert you can do so by pressing the trash can icon on the far right. Trigger and reset conditions dictate under what circumstances the alert will trigger, and subsequently reset. In the Trigger and Reset Conditions details panel, the trigger conditions are listed to the left and the reset conditions are listed to the right. AND Groups - every threshold within a group must hold for the group to be considered to trigger/reset. OR Groups - one threshold within a group must hold for the group to be considered to trigger/reset. If multiple AND groups are created, then only one of the groups needs to trigger/reset for the alert to trigger/reset. Similarly, if multiple OR groups are created, all of the groups must trigger/reset for the alert to trigger/reset. You can switch between AND and OR groups by pressing the toggle button in the bottom right. Trigger and reset conditions must hold for a period of time before the alert state is switched. This time period is configurable, and is specified in minutes allowing you to dictate whether an alert should be concerned with momentary threshold breaches, or whether it should only notify you of long term continuous problems. Create One - a single threshold is created. 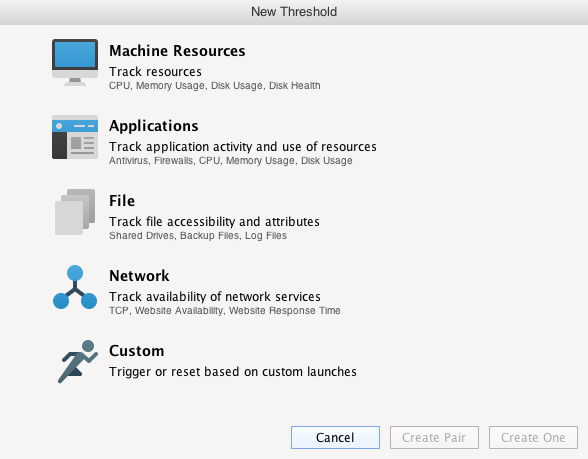 Create Pair - the threshold you configured is created, and a second threshold is automatically created and added to this alert's trigger / reset conditions. If you chose to add a threshold as a trigger condition, then the second threshold is created as a reset condition. Trigger if the CPU exceeds 90%. Reset if the CPU falls below 90%. By using Create Pair, SimpleHelp will create the second threshold for you. The option to create a pair simplifies trigger and reset conditions in situations where you wish the alert to trigger when it exceeds a limit, and subsequently reset if it falls below the limit. If you require more advanced conditions then it is best to create each threshold individually. In the example above, this alert will apply to any remote access service with the name SMTP Server. You can see the matched machines for your filter set by pressing the View Machines button at any time. Trigger and reset actions are actions that the SimpleHelp server will take when an alert switches into a triggered or reset state. If you wish to use SimpleHelp as a monitoring dashboard for your remote access services then you can easily see which alerts are triggered in the alert listing, but actions can be useful if you wish to specify additional steps to take. In the alert overview press Create Trigger Actions or Create Reset Actions to specify actions for trigger or reset events. Save To File - write the alert information to file on the SimpleHelp server. This is useful if you wish to keep track of alert state changes. Send An Email - send an email to any recipients of your choice. This is useful if you wish to notify people via email that an alert has triggered. 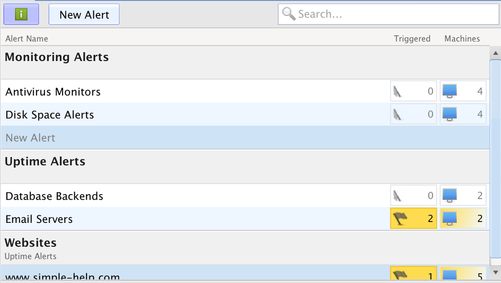 Email actions are fully configurable. Run A Command - run a command on the SimpleHelp server. This allows you to execute a script on the server that may write to file, or populate a database. Send To Website - post the alert information to a website of your choice. Alert information can be posted via a URL encoded parameters, or as a XML chunk. The actions that can be configured are identical to those documented in the standard technician guide here.